*Really, these should say “BARELY Yes”. Both Verizon and AT&T have equally poor coverage in this area. I was able to strategically place my modems, with antennas, to pull in usable LTE service. Definitely not streaming much multimedia, but we’ve been able to do our work. Notes about the surrounding area: Whitney is a small, rural town about 60 miles south of Fort Worth and 50 miles north of Waco. There are several local restaurants and a few chain fast-food spots (McD’s, Subway, Sonic). There is a grocery store in town (Brookshire’s) with a decent selection. To find a Walmart and other businesses associated with a larger city, you’ll have to head 25 minutes east to Hillsboro. This is also where you can pick up I-35. For those looking for some nightlife, there are a few local, watering holes. I’m not certain of the exact law, but they are all private clubs. Becoming a “member” isn’t difficult and we found most of them to not require any payment. We enjoyed The Smokin’ Hawg the most. It’s a BBQ restaurant with a full bar and we enjoyed the two times we had dinner there during our three week stay. We also found a gem in Monte’s Breakfast Burritos – highly recommend the Wildcat! The big attraction in the immediate area is Lake Whitney. It’s a large, man-made reservoir on the Brazos River. There is a state park and Corp of Engineers area in Whitney, on the lake, that seem to be popular destinations. Particular notes about this campground and/or sites: It’s a large, spread-out campground. Its physical size is much larger than its 268 sites would suggest. Most sites are carved out of the thick forest, which makes it quite private. The roads are sub-par, even for TT standards. Sites are mostly gravel with dilapidated pavement underneath and minimal patio space. 50 amp sites are few and far between. We were told to stay away from a block of eight sites, when we checked-in, because they’re being upgraded to 50 amp. During our three weeks here, we’ve yet to see anyone working on those sites. I was told during check-in that no 50 amp sites were available, so this leads me to believe that many of them are occupied by seasonal/annual campers. There were/are plenty of full-hookup 30 amp sites though, with solid water pressure. If there are 50 amp sites available, they cost an additional $3/night for members. There is access to Lake Whitney at the very back of the park and only accessible by walking, golf cart or ATV. The banks are steep and rocky, so not good for swimming, but fishing and sightseeing are definitely possible. Starting 5/1/17, they are charging $2 for each UPS and FedEx package. USPS packages will continue to be no-charge. Amenities: There are two pools (one adult, one family), mini golf, tennis/pickleball court, basketball court, lots of walking/hiking trails, horseback trails (bring your own horse), a large clubhouse, adult lodge, and horseshoes. The adult lodge and clubhouse have free WiFi that works well, in our experience. 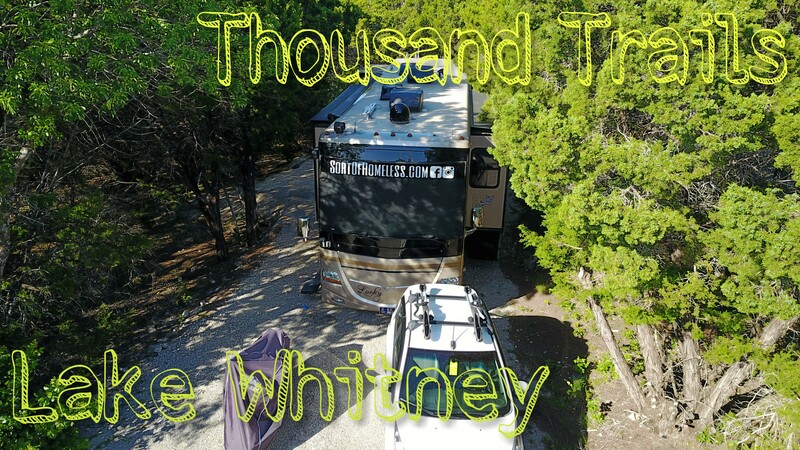 Our experience: We arrived at Lake Whitney after leaving Texas Motor Speedway for our first RV, NASCAR experience. So, a low-key, detox week was nice to have. The limited cellular reception was nearly a deal-breaker, but I was able to make it work. The sites can be really tight with all the surrounding trees, so it was a chore to get wedged in just right and allowing slides to extend. Once you’re in, it can be nice to not be looking directly at another RV. With very small patio space, we set up our two chairs, but spent very little time out there. The campground has been very quiet for the most part. Easter weekend saw a small surge of campers, but our section was still less than half full during that time. For that reason, we’ve really been hermits for the most part. That’s not necessarily a bad thing though. The proximity to Fort Worth and Dallas is an asset of this park. We spent one Saturday night with a visit to the Fort Worth Stockyards. This was a really fun evening and we highly recommend checking out Billy Bob’s Texas – “The World’s Largest Honky Tonk”. 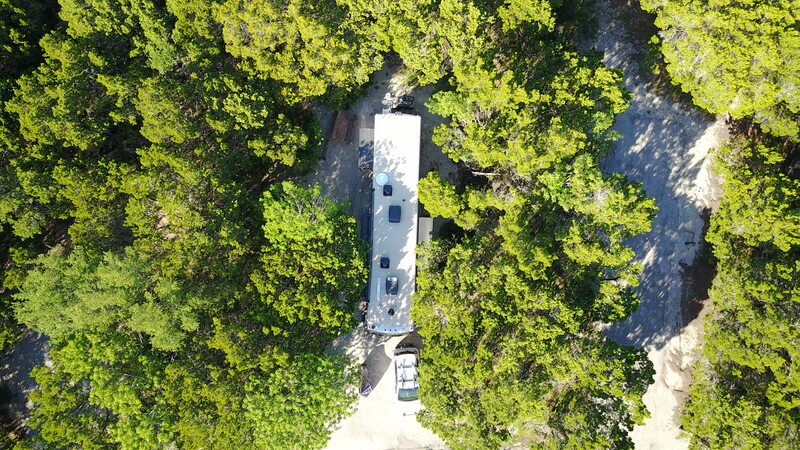 Outside of the poor Verizon and AT&T coverage – which isn’t a fault of the campground – there is nothing in particular to really complain about. The main road leaves a lot to be desired and can be frustrating when you need to run out for a quick errand. There really isn’t a lot that stands out as being special about this campground either, to us. The wooded sites are nice, but it came at the cost of any appreciable patio. I think if you came here with a group of RV’ing friends, it could make for a really nice weekend. Very similar to what I wrote in my review of Colorado River, Spring weather can be a real issue in this area. Tornadic activity is not rare and there is evidence in the area of where twisters have set down. During our stay, four people were killed by tornados less than 60 miles away. Hail is another issue that’s nearly guaranteed if you spend enough time here in the Spring. SOH Score (1-10, 10 being the best campground imaginable): 5.5 – Probably not someplace we’ll rush to get back to. We’re also not upset that we got to see this area of Texas. The highlight of our trip was our visit to Fort Worth, so there are other campgrounds which can accommodate that. ⟵Product Review: Dish Wally – the little receiver that could! Well i love it here quiet no hassles nice people 600 down and 150 a month my old electricity bill was triple that not to mention house pmt water bill repair expences I SAY THOUSAND TRAILS ROCKS IF YA DONT LIKE IT DONATE SOME MONEY INTO A FUND YOU START UP FOR IMPROVEMENT. We were at Whitney for 2 weeks over Easter. Could not get any satellite reception in Sec B. TV and cell phone very iffy. Best part was the fabulous Striper fish my grandson caught from a boat on the lake. Thanks for sharing! I had to be very selective in my site choice for satellite reception. Look for the small patch of sites in the A-Loop for your best bet for making calls or getting useable Verizon LTE data — Sites A57, A58, A59, and A61. Great info, David! We were in B loop for our stay. Thanks!! We were in B 23–sewer backed up. They had a plumber out the next day. Water was off twice while we were there. Adult lodge and pool were closed the entire time we were there. We totally agree about the roads. I think they could put a cell tower somewhere inconspicuous on the property to enhance coverage for members and make $$$ to put toward fixing the roads. Maybe we where there at the same time!? The water was off several times while we were there also. One time for nearly 36 hours. Not a big deal if we had a full fresh water tank, but they put the notice on the windshield of our toad that morning and we hadn’t gone anywhere or noticed it. Life goes on! Thanks so much for taking the time to comment, Sandy! If you’re in the Thousand Trails circuit, I would think it’s highly likely that we’ll cross paths at some point! Hi Ryan, Great write up, happy to hear you dodged the tornados , regarding the Verizon & AT&T signals was that with or without a booster? Hey Bob! That is without a booster. I did hook up a small antenna to my Verizon MiFi.